JESSICA DESVARIEUX, PRODUCER, TRNN: On Capitol Hill this week, it was the battle of the budgets. House Republicans brought their budget resolution to the floor for a vote, which passed with 228 votes — all Republican. But earlier, members of the Congressional Progressive Caucus, or CPC, presented their own people’s budget on Capitol Hill — which garnished only 96 votes — 86 Democrats voted against it. Both budgets claim to represent the interests of the middle class and will help protect people who may face hard times — people like Dawn Maynard. DAWN MAYNARD: I’m a food service contractor, and work for the Smithsonian, the National Zoo. I only bring home $200 a week, and that $200 a week has to support my son, and my husband who has to stop working because he has prostate and bone cancer. If you think $200 a week is enough, it’s not possible to pay bills on $200 a week. Our family has lost our apartment, and our car got repossessed. We use food stamps to feed my family, but I just don’t want no handout. DESVARIEUX: Like Dawn, most Americans are concerned with the economy and jobs, according to a recent Gallup poll. But Americans scored dissatisfaction with the government as their number one issue. So if the government is meant to serve the people, we asked how will these proposed budgets address their concerns? We looked at both the House Republican and the Progressive Caucus’ budgets to examine which budget would lower unemployment and provide a robust economy. We spoke to an economist from the progressive think tank Economic Policy Institute and to the president of the conservative organization National Taxpayers Union to drill into the specific policies of each budget. Ultimately we wanted to find out, in whose interest do these policies serve? REP. STEVE SCALISE (R-LA), HOUSE MAJORITY WHIP: With our budget which has no new taxes, promotes economic growth, has a pro-growth economic policy, pro-growth tax policy, repeals Obamacare, repeals Dodd-Frank, all these rules and regulations that are holding our economy back, and it gets to balance within the 10-year window by getting that economic growth. DESVARIEUX: The Republican budget’s argument for economic growth will mostly be triggered through cuts in spending and taxes. So we spoke with the National Taxpayers Union to find out, where are the jobs? DESVARIEUX: So in the Republican budget, there’s actually no new funds for job creation specifically allocated. 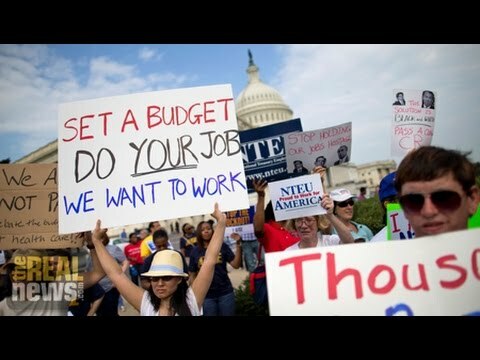 How would the Republican budget actually get people back to work? PETE SEPP, PRESIDENT, NATIONAL TAXPAYERS UNION: The philosophy behind most of the conservative or Republican budgets is grow the economy, grow jobs. How do you growth economy? Well with the limited government perspective you do it by restraining government spending, cutting back on programs that don’t work, making programs that are kind of working work a lot better, and keep taxes low as well as simpler. Do those things, and you reduce a lot of what’s called dead weight loss in the economy. You free up money for job creators, and people who need to save and invest more. DESVARIEUX: But EPI economist Tom Hungerford argues that those savings from taxes won’t guarantee investment back into the economy. By his own analysis, he found that the Republican budget would actually cause the economy to lose hundreds of jobs. THOMAS HUNGERFORD, CHIEF ECONOMIST, ECONOMIC POLICY INSTITUTE: Why do we have a jobs gap of 5.5 million people? It’s just that they’re not hiring, and we keep reducing taxes, and you know, I don’t see any visible effect on the economy. DESVARIEUX: The economy is still behind where it was pre-recession levels — the unemployment rate is down to 5% — but critics attribute that to people who stopped looking for work and who are underemployed, meaning they rely on part-time jobs. Hungerford says the only way to full employment by spending $1.3 trillion over 10 years. That would mean giving aid to states to rehire police officers, firefighters, teachers, and spend on infrastructure — thereby getting money into the hands of consumers and boosting the economy. HUNGERFORD: When the government squirts an extra dollar into infrastructure spending, what ends up happening is it’s going to put a construction worker back to work. That construction worker gets this money, and then that construction worker spends his or her earnings. And that’s going to go to some store, okay? And then that’s going to end up in the pocket of the store owner, the store workers, who are they going to spend the money. That’s what the multiplier effect is. It’s just saying that when the government spends an extra dollar, it gets spent over the next year many times. DESVARIEUX: The CPC budget calls for a Wall Street tax on high speed frequency trades, which could raise $921 billion over 10 years. Also, it would prevent corporations from avoiding U.S. taxes by holding profits overseas, raising $595 billion. Lastly it raises taxes for the richest 2% of individuals who make $250,000 per year to Clinton-era levels, which the CPC estimates would yield $1.4 trillion over 10 years. HUNGERFORD: If you remember, President Obama when he first came into office was talking about raising taxes on people who earn $250,000 or above for a married couple, or $200,000 for a single individual, raising taxes. There we’re talking about 2-3% of the population. And as I said, you know, 75-80% of people have income below $100,000. DESVARIEUX: But Sepp argues that taxing that 2% of the population would cause capital flight to other countries. SEPP: We have to consider whether we’re approaching a point in this country where we’re just not going to wring the kind of revenues we want out of the ultra-rich by simply raising their tax rates. They have options. The French are doing that. When the wealth tax was enacted in France, where did the wealthy go? They went to the UK, where the tax rate is lower. And now they have to consider reversing the policy because they’re just not raising the revenues that they thought they would. DESVARIEUX: But what about tax havens? Both Democrats and Republicans have voiced support for legislation that would allow corporations to repatriate their offshore funds at a lower corporate tax rate, from 35% to 14%. SEPP: If we want to raise short-term revenue in that way, well, Congress can try it. It would probably offer better incentives than raising the rates and perhaps even chasing more money offshore like they did in France. DESVARIEUX: But doesn’t that sort of reward bad behavior? It’s, you know, you’ve done something that you probably shouldn’t have been doing? SEPP: Well, capital — money flows where it’s most welcome, and we haven’t been all that welcoming, necessarily, of some forms of money. DESVARIEUX: The Republican budget doesn’t increase taxes on wealthy or middle income households, but it does eliminate the alternative minimum tax which was designed to limit the deductions wealthy people can take. Middle class families won’t see a direct tax increase, but the earned income tax credit that gives folks a refund for earned wages, tips, salaries and self employment earnings, that would be allowed to expire in 2017. But the CPC budget wants to expand it. HUNGERFORD: Keep in mind that about 80, 75-80% of workers make less than $100,000 a year. So you know, we’re not aiming this to the Warren Buffets of the world but most, you know, the vast majority of working people in the United States. DESVARIEUX: Where Sepp and Hungerford agree is on the issue of defense spending. The approved House Republican budget skirts around directly funding the Defense Department. Instead it adds $96 billion into war funding known as the overseas contingency operations, or OCO. That would bring up the spending to $615 billion in 2016. The CPC budget reduces military spending by $134 billion over 10 years — that’s 17% of what the Pentagon currently spends in one year. SEPP: One of our biggest vulnerabilities as fiscal conservatives can be turning a blind eye to military expenditures. The waste, fraud, and abuse that goes on there not only hurts taxpayers, it hurts the people who are trying to defend us from our enemies. Why in the world do we not pursue this more aggressively? The progressive budget calls for straight-up auditing of the Defense Department. The Republican budgets do to a certain degree as well, but the commitment level is something we need from all members of Congress. DESVARIEUX: But there are further cuts to the Republican budget. Obamacare gets repealed and States would be provided with block grants for public assistance programs like SNAP, commonly known as food stamps, and also Medicaid, the health care system that serves the poor. That means instead of the federal government paying 60% of the cost, states would be given a set amount each year, regardless if the state’s needs vary. We asked our experts how that policy could be in the interest of everyday people — especially since state budgets are already so anemic. SEPP: If a state needs more money, one thing that can be done of course is to lobby Washington for it. They do that very effectively, and have been doing that for decades. Another way is to try and reprioritize their own budgets, away from things that aren’t necessarily serving middle income and working class families. HUNGERFORD: States are struggling. So a lot of them won’t be able to make up the difference. So essentially what we’re doing is cutting off access to health care and to nutrition benefits for many people. DESVARIEUX: The people’s interest is something that the CPC is trying to put forward. And in order to keep that priority, they are proposing public financing for campaigns. REP. KEITH ELLISON (D-MN): Right now we have a Citizens United political system. That means we don’t really have an election, we have an auction. You know, so we need to change that and put the people back in charge. That’s why we have the campaign finance. DESVARIEUX: While these budget resolutions are largely seen as road maps rather than law, it will begin to set up a framework on how Congress plans to address America’s priorities later in the year.